This one is gorgeous. Created using Rime's delightful art style, and set on one of the game's peaceful beaches, this dynamic theme features just enough animation to be eye-catching, but not distracting. There's a scuttling crab, the fox you follow in-game, and a gently lapping tide. All set to tasteful music and sound effects. Bonus: the tile icons are pretty tasteful too, so it looks consistently brill. Oddworld games have real PlayStation heritage, and Abe’s Oddysee was one of the highlights of the PSone era. 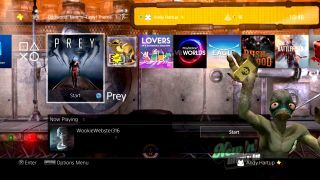 New’n’Tasty brings that back for PS4, but if you don’t fancy actually playing it and just want to see some Mudakons larking about… this theme is for you. You’ll see Abe himself staring at you from the top menu, and he’ll even pop up to wash your screen occasionally. File this one under ‘So cute, you’ll probably vomit every time you switch on your PS4’. This Tearaway Unfolded gopher show features all the lovely vibrant crafts from the game, and - as the name suggests - features a mini show performed by the game’s adorable gophers. Ok, this one isn’t as sublimely animated as Tearaway or Abe’s Oddysee, but it’s still a lovely theme nonetheless. This one is all about atmosphere, with the moonlit cavern from the game slowly dripping water as the game’s gentle soundtrack plays in the background. It’s one of the most relaxing themes on the Store. Hope you like aggressive techno. This theme isn't what you'd call subtle, featuring some vivid colours and a pulsating soundtrack, but it's rather entertaining all the same. Your screen will follow a Tron lightbike as it speeds along an infinite surface. It's striking and if it isn't your thing... you wasted no money on it. This one isn’t associated with any specific game, but it’s well worth a look. There’s a PlayStation-ified robot, with DualShock buttons for eyes, cheekily sat in the right-hand corner. He doesn’t move much, but when the robot fidgets or messes about it’s a delightful little sight. Arkane’s offering doesn’t do anything particularly special, but there’s no denying it features a lovely piece of art. The blue flame in Emily’s hand flickers and burns as you navigate menus, as Corvo sits silently judging the fact you still haven’t played that digital copy of Mirror’s Edge 2 that you bought in the sale 6 months ago. Yes, a second Dishonored 2 theme. This one really shines in the 'lower tile' view. Push up to the upper tiles and all you get is a fat Dishonored 2 logo, but stay on the bottom layer and you're treated to a lovely view of the cost with some wind turbines and a delightful mountain range in the background. Sounds very soothing too. There are a bunch of themes still on the PS Store that were used to promote movies. Most of them - while decent pieces of art - are proper stinkers. Batman vs Superman? Suicide Squad anyone? The highlight is the Ghostbusters theme, which not only shows the colourful promo artwork, but also gives you close-ups of ECTO1 as you shift through the menus. PS4 external hard drives - need more space? PS4 headset - need to up your sound game?